Release Date: October 5th, 2005 (NYC-Angelika Film Center and Lincoln Plaza Cinemas) by Samuel Goldwyn Films. The Cast: Jeff Daniels, Laura Linney, Jesse Eisenberg, Owen Kline, Halley Fieffer, William Baldwin, Anna Paquin. BASIC PREMISE: Walt (Eisenberg) and Frank (Kline) cope with the divorce of their mother (Linney) and father (Daniels). ENTERTAINMENT VALUE: It is very rare to find a film that has a screenplay that so well-tuned its well-developed characters. All four family members are interesting in their own ways. There’s Bernard, the father, who is an opinioned professor who flirts with Lili (Paquin), one of his students. Joan, his wife, is having an affair with somebody right under his nose. It’s no surprise who that man turns out to be---it’s even somewhat funny. Also, their differences are very clear from the start: Joan is becoming a successful writer while Bernard is failed writer. Divorce is inevitable, but it is interesting how their kids react to it once they get joint custody. Walt, the older teenage brother, befriends Sophie (Fieffer), a genuinely nice girl with average looks. However, once Lili ends up moving in with him and his father in a strange turn of events, he lusts for her instead—and, predictably, so does his father. Despite how serious all of these seems, there is some dark, biting comedy to nicely balance it. There are two comic scenes that go slightly too far, both involving Walt and Frank in separate incidents that recall The 40 Year Old Virgin. Although the plot is unsurprising, the performances are quite good, especially Laura Linney’s. William Baldwin also has a fun time playing the role of a tennis coach, although he is much more than that. The soundtrack is also well-chosen, especially the song “Hey You” by Pink Floyd, which you will probably be humming on your way out of the theater. 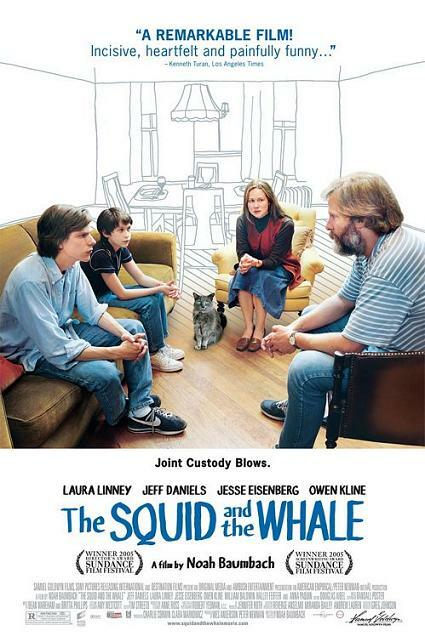 SPIRITUAL VALUE: While watching this film, the first question on your mind is probably, “What does this film have to do with a squid and a whale?” The answer becomes clear soon, as Walt talks to his psychiatrist about a squid and whale exhibit at a museum that has traumatized him since. The image of a these two sea creature fighting is a very smart parallel to how Joan and Bernard are fighting—and how such an experience has a profound effect on those who must witness it. The script is filled with one-liners that may not necessarily be true, but at least they make you think. For example, Bernard says to his son Frank, “Public school teachers are nothing but well-meaning, unsophisticated bureaucrats” and refers to anyone who doesn’t like the books he reads as “philistines.” Be sure to listen to the lyrics to the song “Hey You” because they are very appropriate and relevant to the story and characters. Fortunately, there is no Hollywood ending. In other words, there is no complete closure to the characters’ lives—but that just make it all more real. THE BOTTOM LINE: A well-written, funny script along with well-developed characters, great performances, and some great songs make for a thoroughly engaging and memorable film.